Need to monitor a MSSQL server instance from Nagios? You can use FreeTDS to execute a MSSQL query from a Linux box. # Define where to find the driver for the Free TDS connections. Download the check_mssql plugin to the plugins dir on your Nagios server. You can find it at the Nagios Exchange site. In the above example, Nagios executes the query expects a return of 7, warns at 8, and goes crit at 10. C:Userstechpain>sqlcmd -S servername -d dbname -U dbuser-P dbpass -q "select field1 from column1 where field1 like '10%';"
-v, --version Display the program version Use `-' after `-c' to read the config file from stdin. If no chips are specified, all chip info will be printed. echo "OK - $TEMP1,$TEMP2,$TEMP3,$TEMP4 - cool as the other side of the pillow"
logger "WARN - $TEMP1,$TEMP2,$TEMP3,$TEMP4 - it's getting hot in here"
echo "WARN - $TEMP1,$TEMP2,$TEMP3,$TEMP4 - it's getting hot in here"
I finally got tired of getting Nagios notifications that didn’t have all the info I wanted in them. Specifically, I was guessing if the problem had been acknowledged based on the notification interval (how long since I received the last notification), or logging in to Nagios to check. I decided to customize the Nagios email notifications by editing the # 'host-notify-by-email' command definition, which is the notification type that I’ve been using. This is a PROBLEM notice that DevServer is DOWN! The “This is a PROBLEM notice” part is created by the $NOTIFICATIONTYPE$ macro. This is nice because it tells you what kind of notification it is (“PROBLEM”, “RECOVERY”, “ACKNOWLEDGEMENT”, “FLAPPINGSTART”, “FLAPPINGSTOP”, “FLAPPINGDISABLED”, “DOWNTIMESTART”, “DOWNTIMEEND”, or “DOWNTIMECANCELLED”), which is much more useful than just getting another DOWN notice when a problem is acknowledged. Check out my other Nagios posts, and please leave a comment if you have another tip or trick on customizing your Nagios notifications. The Wireshark Blog, Sniff Free or Die, has a post on running Wireshark on Linux without having root access. 1. Click Start, point to Administrative Tools, and then click Performance. 2. Expand Performance Logs and Alerts. 3. Right-click Alerts, and then click New Alert Settings. 4. In the New Alert Settings box, type a name for the new alert (for example, Free disk space), and then click OK. The AlertName dialog box appears, in which you configure settings for the alert that you created. 5. Click the General tab, and then in the Comment box, type something like Monitors free disk space on C drive. 1. Click Add to open the Add Counters dialog box. 2. Click Select counters from computer, and then select your computer in the list. 3. 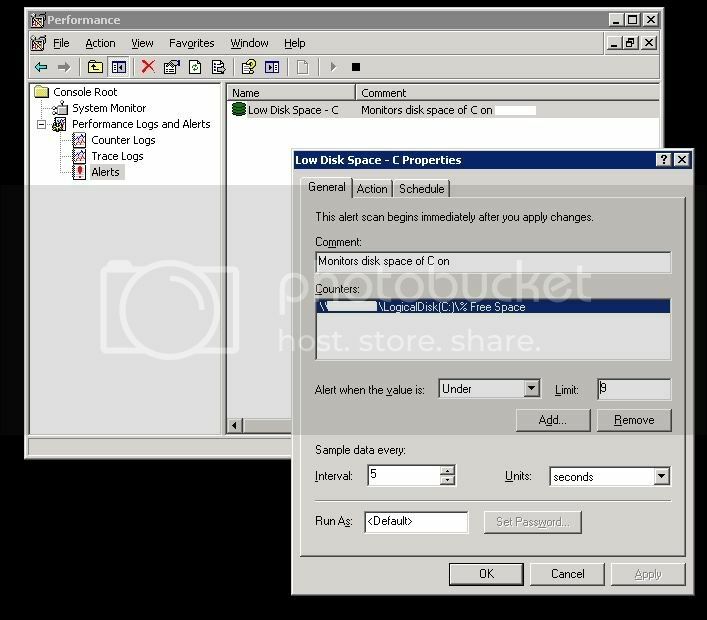 In the Performance object box, click LogicalDisk. 4. Click Select counters from list, and then click % Free Space. 5. Click Select interfaces from list, and then click the logical drive or volume that you want to monitor. 6. Click Add to add the counter, and then click Close. 7. In the Alert when the value is box, click Under, and then type the value that you want in the Limit box. For example, to trigger an alert message when free disk space is under 9%, type 9. 8. Accept the default value of 5 seconds in the Sample data interval, or specify the value that you want. If you want the Performance Logs and Alerts service to create an entry in the application log of event viewer when an alert occurs, click to select the Log an entry in the application event log check box. If you want the Performance Logs and Alerts service to trigger the Messenger service to send a message, click to select the Send a network message to check box, and then type the IP address or name of the computer on which the alert should be displayed. To run a counter log when an alert occurs, click to select the Start performance data log check box, and then specify the counter log that you want to run. To run a command or program when an alert occurs, click to select the Run this program check box, and then type the file path and name of the program or command that you want to run. Or, click Browse to locate the file. When an alert occurs, the service creates a process and runs the specified command file. The service also copies any command-line arguments that you define to the command line that is used to run the file. Click Command Line Arguments, and then click to select the appropriate check boxes to include the arguments that you want to implement when the program is run. Click Manually if you want to manually start the scan. After you select this option, right-click the alert in the right pane, and then click Start to start the scan. Click At to start the scan at a specific time and date, and then specify the time and date that you want. Click Manually if you want to manually stop the scan. After you click this option, right-click the alert in the right pane, and then click Stop to stop the scan. Click After to stop the scan after a specified duration, and then specify the time interval that you want. Click At to stop the scan at a specific time and date, and then specify the time and date that you want. 3. If you want to start a new scan after the alert scan is complete, click After, and then click to select the Start a new scan check box. CRC is a method of detecting errors in data transmission. A high CRC count in itself is not really cause for alarm. However, any increase in CRCs after your initial connection is established is a problem and usually points to a physical issue somewhere.